Alex from Brantford said ... Since the beginning of last year I have seen four Eagles in Brant county. The first was early February of last year in Osweken, on Six Nations, there was also a article in their local news paper where one landed on the road downtown! It was very welcome news for the native people as Eagles are a big part of their culture. The next sighting was early this year, I was out with my dog early in the morning in early January when the bird flew overhead over a field where I live. The next one was soaring over a bend in the grand river by Cockshutt bridge, and the final sighting was about a week ago. It was a juvenile (no white) in a tree in a field just outside west Brant. Whenever I see them I always need to double take in disbelief. Red Tailed Hawks and Turkey Vultures are also very common here and an Eagle can sometimes be mistaken for one. I hear they also sometimes scavenge at the dump with the Vultures and Gulls. Jim from Oakville said ... Monday, March 30th, 2015 around 10:00 am, I was walking the East Trail along 16 Mile Creek by Glen Abbey Golf Club and spotted a single Bald Eagle soaring alongside the east cliff of the 16 Mile Creek. Last spring I did see a pair of Bald Eagles in the same area heading North towards Milton. I walk this trail daily and hopefully will be fortunate to have more sightings and have my camera ready. One of our readers wrote ... When I was driving along the Ottawa River just before the bridge into Aylmer, Quebec, I saw a Bald Eagle, no confusing it either since it had a huge wingspan and dark wings with a white head and tail with yellow feet, swooping and driving and there were some crows/ravens chasing it. Was around 6:30 pm Saturday April 4th. Caroline from London, Ontario, said ... On February 28, my daughter and I spotted a Bald Eagle as we were walking our dog. We live in Orchard Park neighbourhood in London, which is close to ravines and creeks. I had to do a double take, but it was unmistakable when I saw its profile. It was soaring above our neighbour's massive maple tree, and we followed it's flight as it circled above the trees. My 7-year old daughter wondered if it would be able to tell that our little dog was indeed a dog, and not a meal! I have to say, the same thought crossed my mind. We both felt excited and amazed at this sighting! some Robins at the time. In my 31 years living in Ontario, I had never seen one before! Candace from Mississauga said ... I was walking along a bridge on Burnhamthorpe Road which overpasses the Credit River when I happened to notice in my peripherals that a rather large bird was in the sky. At first I thought it was a crow but then I saw the iconic white head, its wing span, and the way it was flying and realized very quickly that it was a Bald Eagle! I was very surprised as I assumed that I would never see a wild Bald Eagle, living in Mississauga! He kept flying and circling around and I wanted to stay and watch him for longer, but I had a bus to catch! I tried to take a video but he was too far up in the sky for my cell phone to catch it clearly. Lenna Phenix said ... On May 17, my family and I were enjoying an afternoon at the cottage located on Martin's Islands on Lake St. Clair. While enjoying the breathtaking surroundings, I heard a bit of a ruckus and looked up in the trees of the neigbouring island. I called everyone's attention to what I saw. 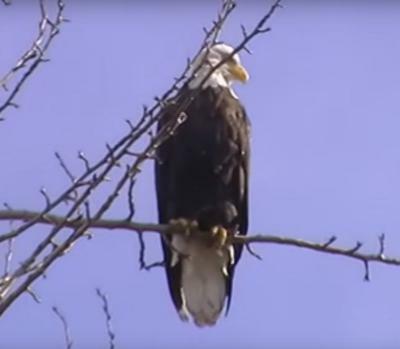 We witnessed an incredible sight of a Bald Eagle in flight chasing a Canadian goose. It truly was a sight. I haven't seen a Bald Eagle on the lake in 7 years so it was reassuring. Hoping to see more of them. A reader wrote to tell us ... Bald eagles on The Trent have been here for 3 or 4 years now, boats can drift by for a look see at the nest and watch them perched on the nearby trees. They seem to coexist with the Osprey on the same lake. The Eagles also have another tall pine perch about a mile away on the river ! Great to watch them from the porch every now and then. S.Clipperton from Innisfil said ... On May 21, 2015 at approximately 10:00 am, while sitting in my living-room chair, I saw a pair of Bald Eagles circling above Alcona. (North of IBR near 25th S.R. ), lazily making their way towards Lake Simcoe. Birding from my living room, priceless! Debbie Wood reported ... Yesterday around noon, an adult Bald Eagle flew over Jordan Road by Harbour Estates Winery heading towards the lake. Rick & Lynda from Fenelon Falls wrote to report ... April 25th at the ninth hole at Sturgeon Point Golf Club, Fenelon Falls, Ontario, a young Bald Eagle sitting high in a tree. Unfortunately we did not have our camera with us. Next time! He was beautiful! Thank you all for your submissions to our website - I know many of you wrote in several months ago, and I apologize for the delay in publishing this. On December 26, 2018 I and co-occupants of our vehicle spotted a mature Bald Eagle flying up from the Grand River and near our vehicle as we crossed the Grand River on Hwy 403. Nice to read on your webpage about eagle sightings in SW Ontario. On October 8, 2018 I spotted and photographed an immature Bald Eagle along Nova Scotia Line, between County Rd 40 (Springfield Rd) and County Rd 43 (Richmond Rd). I am familiar with that area and have seen Bald Eagles not too far from there - I saw one in Port Bruce, and also further east, near Norwich. I believe I saw an immature Bald Eagle today on the Gore Road, just south of highway 9, Caledon, Ontario. I have been watching a Bald Eagle nest on my property for almost 5 years now, we have seen 4 offspring come from this pair of adults - last year they had 2 offspring. I can sit in my office and look out the window and see the nest (in the winter). They are magnificent and its always a pleasure to see them reproduce. Location: Jordan Station, Ontario, just south of the Q.E.W. Spotted a Bald Eagle at the 407 and Britannia today October 21 just hanging out in a tree. I was driving the 407 today and 2 large birds caught my eye ... they looked like Bald Eagles!! I didn't know if that was even possible ... so I went home, grabbed my camera and returned. And certainly YES! 2 Adult Bald Eagles in an old dead tree. Well, that made my day!! Driving up highway 10 south of Caledon mountain at 1 pm today, I saw what seemed to be a Bald Eagle (white head and tail) riding thermal wind on the east side of highway close to Ken Whillans Conservation Area lake ... no camera with me.